I feel like my Mumma while I type this out but that's not going to stop me from saying this- Times Have Changed. (?) With everything going digital, there's not much that you have to worry about when planning your wedding. I mean, we made an entire wedding planning app for you to plan your dream wedding online and book wedding vendors too! Hehe. But out of the crore big and small things that you need to plan for your wedding, we urge you pay attention to your wedding invites too! After all, an announcement should be worth the excitement that is to follow, right? Agree, nothing beats the joy of holding a freshly-printed wedding invite- the one that you spend days working on, alongside your wedding card designers. But imagine sitting on your desk on a dull Thursday afternoon, and suddenly getting a digital card to your BFF's wedding on your Whatsapp? Or maybe waking up to a hilarious whatsapp wedding invitation video of your cousin and his fiance pranking each other, asking you to join them on this craziness at their wedding week in Goa? Now now, that's the kind of stuff that would make me jump with excitement! 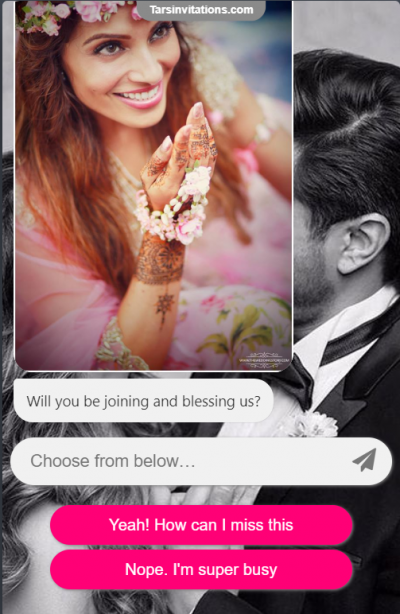 With all this tech-spurt, digital wedding invitations have really come a long way and how! Nobody wants to see those gold and red cards with pictures of Gods anymore. A cooler, more viable way to send and receive wedding invitations are now over the internet. That's why whatsapp wedding invitation is the way to go now! Fret not! We've made this Know-It-All guide- now know the different ways you can invite your guests for your wedding, along with details on online wedding card maker apps that are super easy to use and unique wedding card wordings! Read on to know more! Take It The Traditional Way (Well, Almost) And Send Them A Text! While the internet is flooded with new, interesting ways to invite people for your wedding (oh trust me, there are many! ), in a world of passing trends, you can still stick to the plain ol' means of sending a text. To begin with, it gives you the liberty to write exactly what you want to say with zero show-sha! All you have to do is come up with something interesting, and cope paste it to all your contacts! 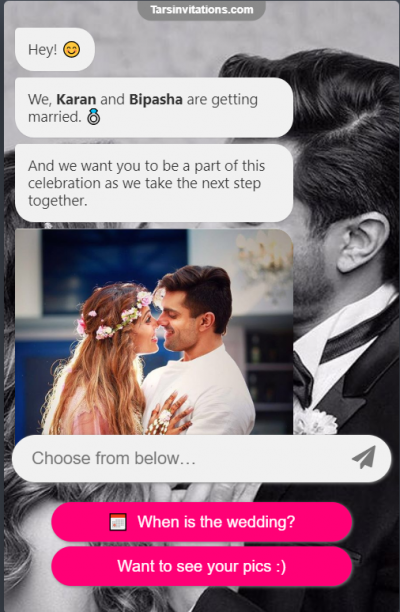 Now now, before you give me a 'Boo, boring', let me share a few wedding card format examples on how you can take the plain-Jane route and yet add a certain level of drama to your messages! life gave us a fairy-tale. We're getting married!! Maybe now is a good time to finally see us? Alcohol, food and bad dance moves- You in or what? ✔️ Will attend... FREE BOOZE... Hell yeah! Scan Your Cards And Press 'Send'! After multiple long sessions and countless meetings with your designers to come up with the perfect invitation card- wouldn't you want everybody you know, to see the masterpiece that is your marriage invitation card? Well, a good way to go about it would be to get your cards scanned, and share them over Whatsapp, Email or even Facebook! Simple! First impressions matter. And that's exactly why your wedding invite should set the tone for your wedding? You can get digital cards, or e-cards to be shared with your friends and family. Whether you want to share something with just details of the event or have something with a dash of color and pictures- the choice is yours! Another trend that's really catching on like the flu is that of illustrated wedding cards! With quirky, animated doodles of you and your partner, these illustrations usually tell a story with tonnes of eye-catching colors and cute details! You're going to get married only once, so why not have some fun! We made a list of illustrators who can help you design some of the cutest Save-the-date cards. Find more ideas on illustrated wedding card formats here! How About Video Invites To Keep Your Guests Hooked Till The End? 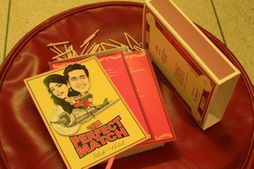 We love love LOVE an innovative wedding invite whenever we see one! And what could be more interesting than a video? I mean, it's one thing looking at a digital card, but a video is an entirely different level of entertainment. And if you can pull it like a pro, who would mind sitting through the entire snippet, again and again? Why Should You Send An Invitation Video? Well, to begin with, there's a combination of all 3- music, pictures and text that keeps a viewer hooked. And the best part, invitation videos are more personalized and allow you to tell your story exactly how you want to! You could use a slideshow of your pictures with your partner, or recreate a peppy Bollywood song- there ain't any rules. So, we urge you get as creative as you can! 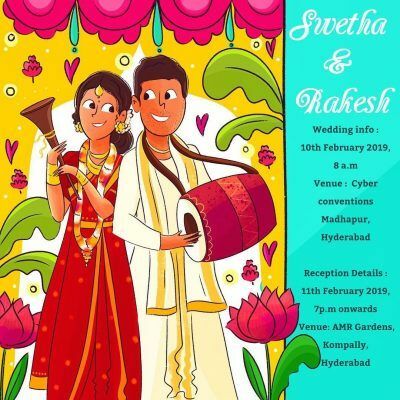 How You Can Create Wedding E-Invites? Whether you simply want to be more involved in your wedding, or are just one of those people who're fans of DIY-ing, here's something for you too! Who said you need to get a professional on-board? To begin with, finding a professional who matches your style and preferences can be a BIG task...and lets also not ignore the added cost that comes with it. So why not DIY some invitations? Go on the internet, and use your fingers- a few clicks, and that's all! Or maybe you can just ask one of your techie cousins to help you out with online wedding card maker apps. If you wish to create a video invitation card, you'll find multiple all-in-one video editing apps on the internet that are not only easy to use, but also quick to grasp, with some amazing tools! Just shortlist your favorite pictures and pick the music you like and make a 2-minute snippet or a longer invitation-video, inviting your friends and family for the big day! Here're our top picks that you can definitely give a shot! Psst. We Have Something More- A SURPRISE, For The New-Age Couples! 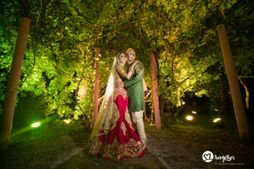 Whether you are getting your wedding cards delivered at your guests' place, or sharing them over Whatsapp, Facebook et all, there's one thing that's inescapable- the countless excited responses saying "OMG, tell me more! ", and "Wow, where is the wedding, do you need help with something", among others. Now tell us, if you're planning on inviting 150+ people, will you have to time to respond to each one of their messages? No, don't! Before you make that face, let us tell you about a new, cooler way to send across your invites that is both, customized and engaging! How? 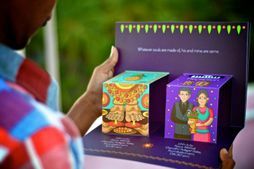 TARS invitations is your genie in a bottle! A chat-based invite which is highly engaging and interesting, but here's the catch! You won't have to worry about communication anymore because a BOT will be doing it all on your behalf! It's like your own personal assistant taking over chats with your guests. Now doesn't that sound relieving! You can experience chat-based invites here- don't forget to answer as you go! How About Having An Entire Wedding Website? Wedding Website are a trend that has been around or a while, and super helpful when it comes to coordinating everything about your wedding! 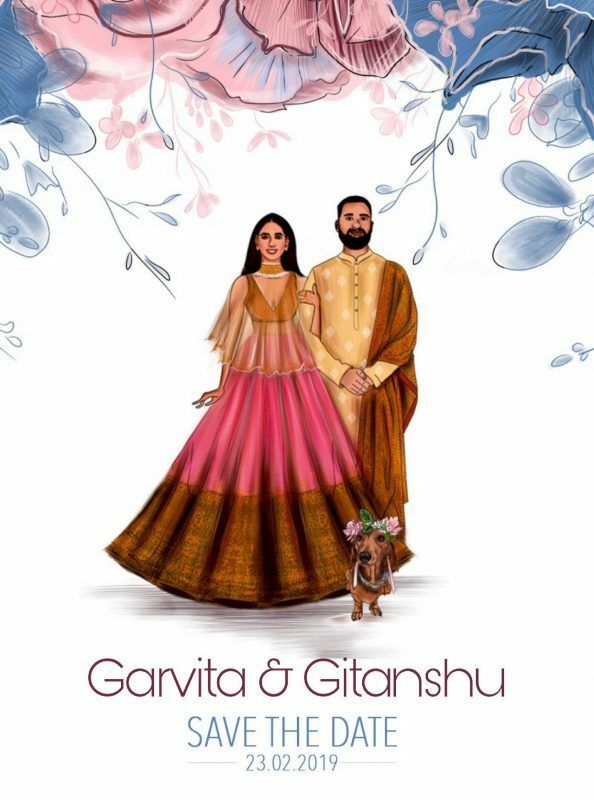 And using it as a whatsapp wedding invitation is a genius idea! 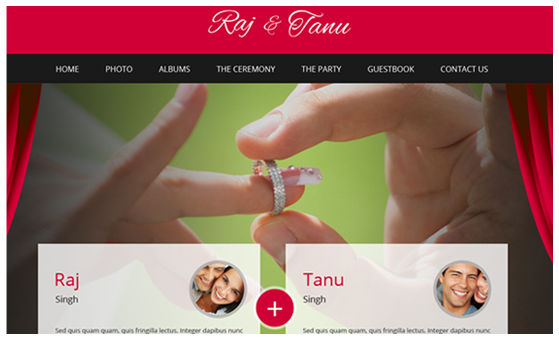 Essentially, a wedding website, or a wedsite, is one where all your information about your wedding in in one place! Venue information, directions to reach the venue, timings for each function, and every other detail you would want to give to your guests! While some people choose to build their wedsites from scratch, many opt for pre-built templates so you can get your wedding website up and running in about a day. 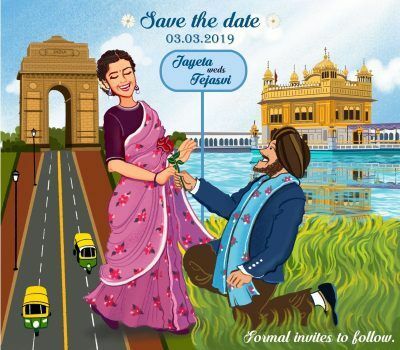 Whatsapp wedding invitations are unique and customizable. Whether you choose to send a card, video, or a text, feel free to choose what you want to send. And you can also decide who to invite for which functions! They're quick, and secure. Now no more parcels getting lost in transition. And don't forget, they're environment-friendly too! Now is that a nodding head we see? #TrendAlert: How To Create A Forest Wedding In Your City! 30 Unique Standout Wedding Invites You've Just Got To See!